Designed to improve upon the pickup truck with spray unit long used in lawn care, the Maverick hits the mark. For one, it’s less expensive. Beyond that, its tighter turning radius offers superior maneuverability on the road. A larger bed makes it easier to work with equipment and provides greater storage capacity. 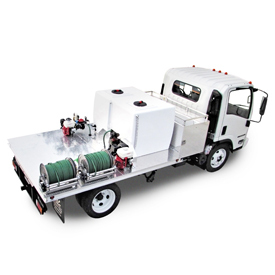 See more features and options, including a ride-on spreader carrier, at GrahamSE.com.